Schlock-Wire: Free Alternate Cut DVD-R Of INTRUDER For First 500 Buyers Of Synapse’s New Blu-Ray/DVD Combo – Schlockmania! ROMULUS, MI – November 8, 2011 – Synapse Films announces an ultraexclusive Special Edition INTRUDER Workprint “NIGHT CREW” DVD-R disc to the first 500 fans who purchase the INTRUDER Blu-ray/DVD Combo directly from www.synapse-films.com. 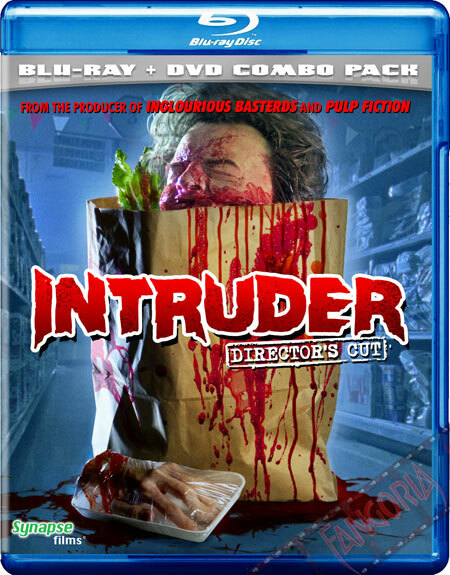 This Special Edition disc is an individually burned DVD-R (not manufactured at a pressing plant) of the original workprint of INTRUDER (aka NIGHT CREW), containing additional scenes, different editing, and extended gore sequences that only appear in this singular edition. Presented in its original workprint state—non-anamorphic and with no final music or sound effects mix—and taken from the director’s sole personal VHS copy, you can even hear director Scott Spiegel giving off-camera direction to the actors in some scenes. If you’re a fan of this film, you owe it to yourself to head over to synapse-films.com and secure your own copy of INTRUDER along with this extremely limited ultraexclusive special edition DVD-R.